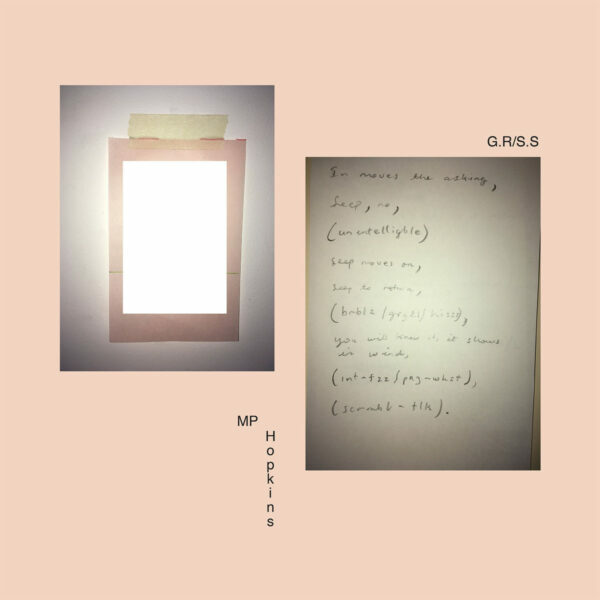 Process art from Australian sound-artist MP Hopkins on his G.R/S.S (AUSSENRAUM RECORDS AR-LP-009) album, who last regaled us with his site-specific tape piece called Aeroplanes & Puddles from Feb 2018. This vinyl item from Swiss imprint Aussenraum contains two unrelated pieces… ‘The Gallery Rounds’ on Side A was assembled from Hopkins’ field recordings he made in art galleries and museums over a number of years, where he wasn’t so much interested in the exhibits as the buildings, the outside sounds leaking in, the people wandering about the institutions with echoing footsteps, and their occasional murmurings of engagement as they encounter a piece of Etruscan pottery in a vitrine. It’s vaguely interesting to the extent that he managed to layer the sounds to compress multiple events into a single plane, and then applied filters and effects to perform certain transformations on these everyday sounds, but the sonic information presented feels random, ineffectual, a jumble of meaningless non-events. Hopkins’ intention has been to comment on the nature of how we consume culture, in the form of what he calls “an audio diary”. Yet if there’s any editorialising going on in these bland, drifty assemblages, I am unable to locate it. The B side is given over to ‘Scratchy Sentence’, a single piece the artist made working with numerous synthesizers at the Electronic Sound Studio in Melbourne. Hopkins freely admits that he has no idea how these machines work, but he kept trying until he was able to coax noises from the Synthi A and a couple of vintage ARPs. He then imagined he was holding a conversation with these instruments, and decided that his responses should take the form of his own voice processed through a Vocoder. There’s the potential in this set-up for a fascinating failure, a mess of crude noise generated by a non-expert as he plays with devices beyond his ken; instead, we get a tedious flat drone, which is about as smooth as beige wallpaper. When Hopkins interjects his occasional Vocoder bleatings, the result is like late-Kraftwerk records remade by the Muzak Corporation. His suggestion that this flabby experiment represents “some sort of electronic, scratchy dialogue between human and non-human’ fails to convince. In both these works, I am disappointed by the lack of engagement evinced by MP Hopkins; in the first, he remains unfocussed and wispy, unable to perceive what might be true or worthwhile in a morass of audio snapshots, and does not deliver on his promised subversive statement on consumerist society. In the second, there’s a distinct lack of adventure or experiment in his synth playing, as if afraid to unleash a power which he can’t control. A dreary LP. From 19 February 2018.